Here's a slightly older book (published 2003) that I had the pleasure of reading for the first time this past month for school. I loved it a lot, and I highly recommend it to anyone looking for a very good contemporary novel! When Nicola sets out to spend her summer at an institute for academically gifted teenagers, she’s hoping to discover if archeology is her calling. What she finds instead is friendship with Isaac, Katrina, and Battle. Friends have always been like extracurricular activities to Nic—they come and go with afterschool activities and classes. Her true connection with Isaac, Katrina, and Battle is surprising and welcome, but even more unexpected to Nic is her electric romance with Battle. Empress of the World is a smart, incisive book that really captures the rhythms of teenage relationships and interactions. Ryan writes the exchanges between the four friends well; conversations slide from silly to serious in an instant, and the mix of thoughtful expressions and stupid mistakes are so apt for these teenagers, who are free from close adult supervision for the course of the story. Nic’s romance with Battle is sweet and natural, and both girls resist the pressure to acquiesce to any label, and Ryan steers the focus of the story away from Nic’s sexual identity. Instead, Ryan explores Nic’s romance and relationship with her new friends by examining Nic’s need to deconstruct every relationship to understand how it works—her narrative is full of “field note” and analyses of her social group as a way to try to understand friendship and first love. The tendency to read into every situation and try to understand her new friends certainly gives Nic empathy, but Ryan also shows how it can hinder Nic’s relationships. 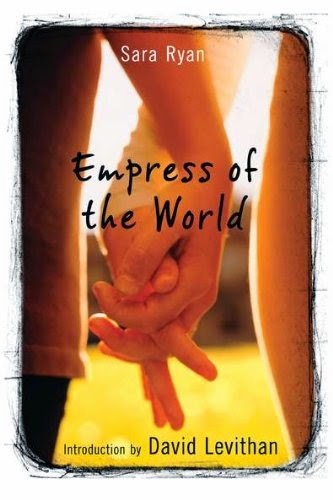 Empress of the World explores the emotions of first love, mistakes, and the bonds of friendship beautifully. Cover Comments: I'm not wild about this cover--two clasped hands. Okay. Yawn. But, it doesn't do anything to deter me from the book either, so okay. It could be better. Sounds really interesting! I love the premise of it quite a bit, so I'll try to give it a shot, but I agree with you about the cover. I LOVE this book, and have read it several times since it came out years ago. I'm so glad others are discovering it, I feel like it kind of flies under the radar these days. Sara Ryan wrote a sequel to it, too, called The Rules for Hearts. It's not as good but you can get your fix of some of those characters!